There are just 25 objects, including a Madonna, some trousers and a chest ornament, in San Francisco Asian Art Museum’s Philippine Art: Collecting Art, Collecting Memories exhibition, raising doubts that such a complex culture could even begin to be appreciated, much less fathomed, through so few specimens. Adding to the problem, all artworks are donations, not the result of an orchestrated acquisition program. For the first two decades, the Museum had exactly zero Philippine pieces. Today, it has managed to scrape together just 60 objects among its 18,000 total to represent these highly diverse islands. To mount an exhibition of random donations is perilously presumptuous—the equivalent of attempting to showcase a country’s culinary heritage through an impromptu potluck. Fortunately, as anyone ever invited to one will attest, one is very well fed indeed at a Filipino potluck! Despite the odds, the exhibition succeeds to reveal great truths from meager evidence, in the way a DNA test succeeds to reveal volumes on cultural identity based on a tiny sample of saliva. A close study of the artworks rewards visitors with insights into racial makeup, ancestral trade routes, and migratory histories. The first of three sections, Precolonial Roots, displays intricate costumes, textiles, jewelry, vessels and sculptures made by several of the indigenous peoples that resisted Christianization. One piece, the salwar trousers of the B’laan peoples, intrigued curator Natasha Reichle as possibly unique within Asia. With no written Philippine precolonial records to consult (none exists; only two manuscripts from China and India refer to the period), Reichle turned to linguistic analysis for insight. She noted the term’s similarity to Shalwar, the Turco-Persian pants and tunic costume. The trousers could be an artifact influenced by the Islamic traders active in the 1300s-1400s, before Spanish colonization. Another Muslim-influenced object is an intricately carved silver betel box, whose arabesques evoke the mythical Sarimanok bird, perhaps inspired by an Islamic legend of Mohammed encountering a rooster in the seven heavens. The Sarimanok is still ubiquitous in Maranao art of the Mindanao region, where the Muslim Sultanate of Sulu continues to thrive. In one photograph, a northern Mountain Province woman wears a chest ornament (sipatal) of mother-of-pearl shells, similar to the one on display, evidencing trade between coastal and upland folk who lived hundreds of miles apart and bartered rice for shells. Some glass beads in similar antique necklaces were traced by one collector (not in the show) to Europe in the Middle Ages. It is exhilarating to think how centuries of time and migrations across continents of space can come together to live preserved in a few precious strands wrapped around a tattooed neck. 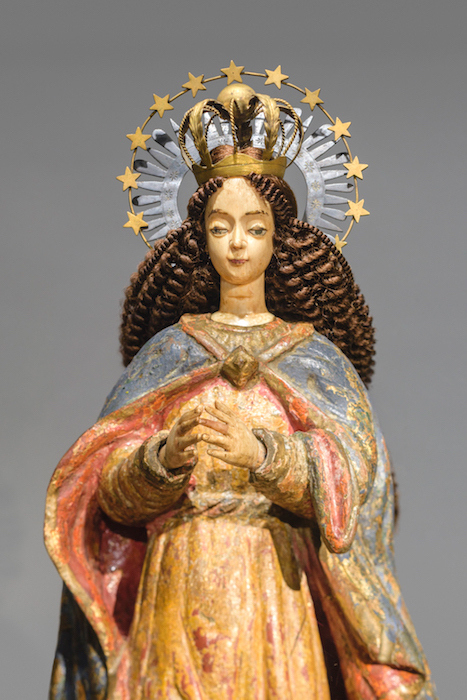 The Museum recently acquired wood-testing equipment, useful for objects such as the Our Lady of The Immaculate Conception statue from the Spanish colonial period that could be mistaken for Latin American. It tested to be Molave, a tropical Southeast Asian hardwood, contributing another layer of authentication to the Museum’s process that included consulting with experts in the Philippines. Bald when acquired, the statue now wears a charming wig, commissioned by Reichle from a Filipino store found on Facebook. These entrepreneurs thrive on making human-hair pieces exclusively for icons, proof of how much Catholic statues are still in devotional use, making it difficult for museums to acquire them. A carved wooden body of Christ, each rib articulated, and minus the cross to which it was formerly nailed, is painted to resemble ivory. With distinctly Asian features, this Christ cannot be confused for European. The face clues us in to the sculptor’s identity: in colonial Philippines, the Chinese (Sangley) were elite artists who found new customers for their ivory-carving skills in the Spanish missionaries. Gracing the Modern Period section is National Artist Fernando Amorsolo’s Farmers Working and Resting; his idealized countryside scenes inspired the slang term "Amorsolic," meaning bucolic. Nearby is Anita Magsaysay-Ho’s, Popcorn Sellers in The Luneta, an unusual subject for her. Magsaysay-Ho was Manila’s first acclaimed female painter, the only woman in the 13 Moderns group that led the charge for modernism. She is best known for her iconic bandanna-wearing heroines, depicted as archetypes rather than individuals, choreographed into tableaux of sisterly camaraderie, selling fish, raising chickens and harvesting fruits. While her male counterparts were painting innumerable Madonnas with child, keeping the woman anchored in traditional roles at home, Magsaysay-Ho’s entrepreneurial women were out working in fields, forests and seashores. Magsaysay-Ho’s art, now considered feminist, captures the Filipina women’s foundational role in a society that has elected two female presidents. 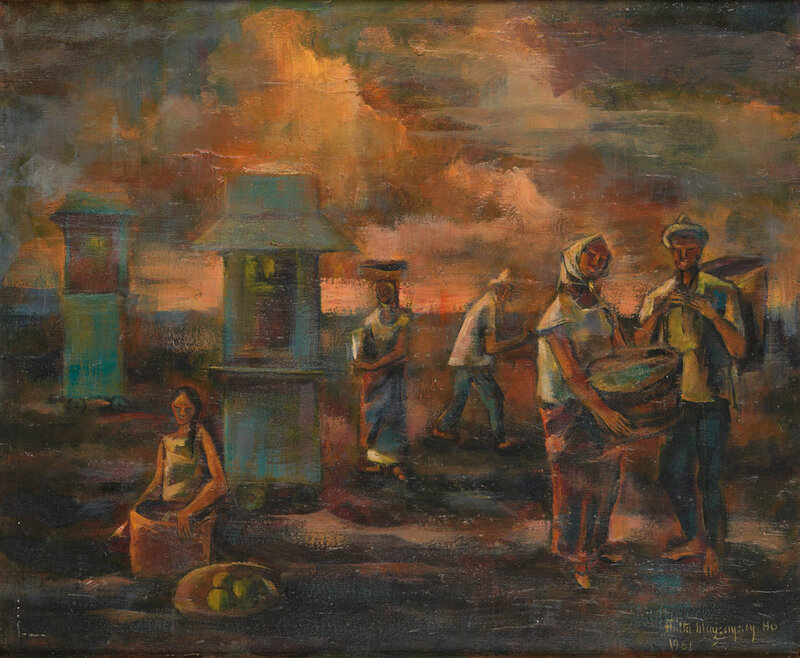 Researching this artwork led me to Filipiniana blogger, Tomas “Buddy” Gomez, who recalled the early Luneta popcorn vendors and perfectly described their galvanized metal carts without seeing the painting, confirming that the scene was drawn from life, not imagination. As such, this painting may be additionally valuable as a historical record of a food introduced by the American occupation. (The Spaniards planted corn only for animal feed.) Painted in 1961, just 15 years after the Philippines gained independence from the U.S. on July 4, 1946, it may be one of the earliest modern paintings documenting America’s corrupting influence on the rural diet of now Coke-swilling Filipinos. Two works from the Marcos period, National Artist Benedicto “Bencab” Cabrera’s etching 1081, and Pablo Baens Santos’ Adornment of the Street portray dead bodies that eerily echo current news coverage of President Duterte’s drug wars. Bencab’s work immortalizes one of those unforgettable where-were-you-when-it-happened moments: Ferdinand Marcos on TV declaring Martial Law; 1081 is the number of the proclamation. 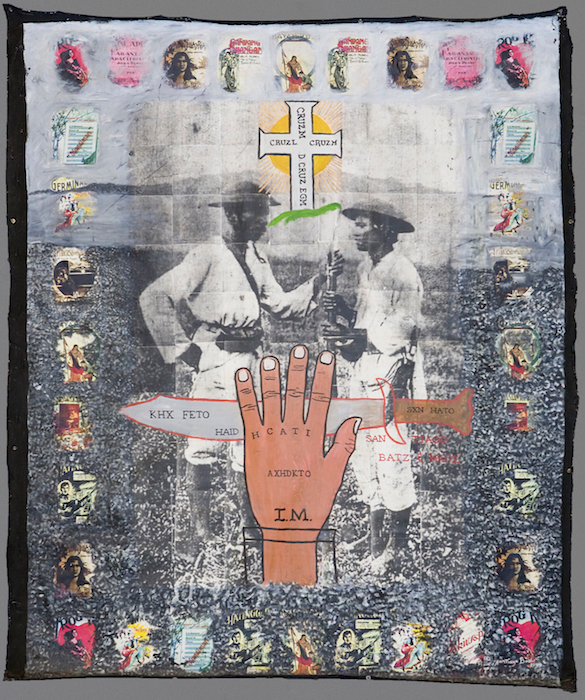 Santiago Bose’s Native Song is dominated by life-sized photographic images of two revolutionaries and is inscribed with pseudo-Latin texts from magical amulets worn by guerrillas of the time. (Revolutionary soldiers are a recurring motif throughout centuries of Philippine art; elsewhere in the exhibition, on a colonial retablo of San Ysidro Labrador, a troop improbably appears in the narrative.) This large contemporary work displays Bose’s unique syntax, arranging Philippine historical and pop culture imagery into modern allegories. Once asked by interviewer Jonathan Best why he used old photos in his work, Bose replied, “It locates you in a certain point in time and then when I paint over it, it becomes an engagement with the past and the present. “In a catalogue essay from another Bose show, critic Alice Guillermo writes, “the anting-anting (amulet) manifests cultural hybridity and religious syncretism, fusing traditional Christian symbols with folk apocrypha and cabalistic arcana.” It is a description that could easily apply to Philippine postcolonial culture as a whole. Guillermo’s essay also offers a clue that helped me solve a question that puzzled the curators and the painting’s donor: why had Bose included seemingly unrelated folk music album covers in the work? Bose named author Reynaldo Ileto as one of his influences. In his book Pasyon and Revolution, Ileto advocates a “history from below”, an alternative approach to the predominant practice of writing Philippine history based exclusively on documents from the elite, educated class and proposes to include sources from the masses such as their peasant songs (awit). Philippine Art: Collecting Art, Collecting Memories is a decent effort from a determined Museum staff who are painfully aware of the need to acknowledge, despite budgetary challenges, the Filipino American community, the largest Asian minority in the Bay Area. Yet, in showcasing the marvelous collision of influences and cacophony of stories that make up the Filipino, the exhibition unwittingly provokes a broader Asian conversation. Visitors to Asian museums like this one are conditioned to expect serene Buddhist art and minimalist Zen gardens and many are bewildered, even angered, at encountering Catholic Baroque aesthetics. They think they are lost but are in fact in the right place for an epiphany. With a unique culture that is much closer to Latin America than to its regional neighbors, the Philippines, even in small glimpses such as this one, forces an audience that presumes to know what Asia looks like to look again. Philippine Art: Collecting Art, Collecting Memories runs until March 11, 2018 at the Asian Art Museum, Larkin St. San Francisco. France Viana is a Bay Area visual artist, art historian and curator.